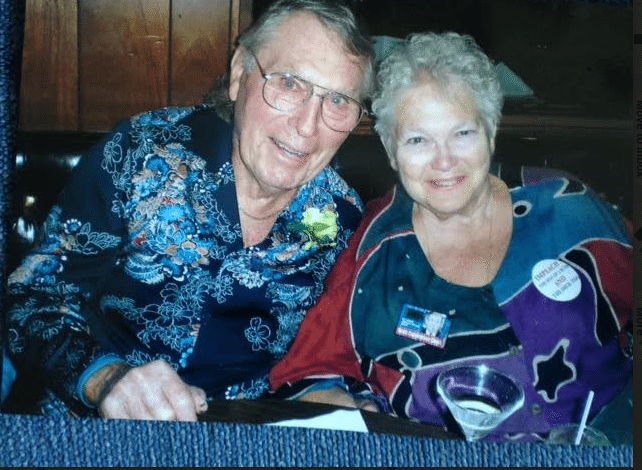 Judi Curry and her late husband, Bob. It has been no secret that I have been terribly lonely since my husband died seven and a half years ago. Our 51st wedding anniversary will be April 5. I was married at 17 (to my first husband) and have been married many, many years over the course of my life. I really never lived by myself, and have always been a “pair.” The past few years have been very difficult. Last night I was reading an article on how you can order just about anything from Amazon.com. I know that I have bought many, many things from them; have had food delivered both from restaurants and Amazon Prime. Just last week I even hired a handyman from Amazon. So I wrote to Amazon and told them what I was looking for in my quest for the “perfect” – for me anyway – companion. He should be between the ages of 66-76. (I prefer to be known as a cougar)and must like dogs. He could be slightly overweight, but not grossly overweight. And one additional thing that will bring embarrassment to my children – must be able to sexually perform. And, most importantly, he must live in San Diego County. I did not want someone who went to the gym every day – after all, that would mean I would have had to go too. I have already raised my family so wanted to make sure that no one under the age of 65 contacted me. The man had to be single – not separated – and someone who did not want children. I did not want a man that had to take Viagra just to get excited. I also did not want anyone super religious, since I am an agnostic and that would be a breaker for me. I can’t tell you how excited I was when I received an email from Amazon with the subject line stating “Perfect Match.” I even hit the wrong key when trying to open it. And there on the page were five men with their profiles listed under their pictures. They all had something to offer, and most of the five had EVERYTHING I wanted. “Where to begin?” I asked myself. I could start with the oldest and work to the youngest, or I could start with the youngest and work up. (After all, I really prefer the younger ones.) I began to classify them by height, weight, color of eyes, education – notice I did not list that as a positive or a negative – whether they had grammar errors in their profiles; whether or not they used slang – “cos” – for “because”; or called me “Queenie” or “Beauty” or “Sweetheart” or a whole list of other adjectives. I looked at where they physically lived – closest to Ocean Beach/Pt. Loma received more points than those that lived in Carlsbad, for example. I figured that since I was receiving the names from Amazon they had all been vetted so I did not have to do a credit/criminal check. And so I began my quest in earnest. I contacted the first on my list and we agreed to meet at Chili’s for coffee. He was all that he said he was in his profile, but he kept asking me who I lived with. When I told him I had 4 roommates, he cooled off. He probably was looking for a place to stay. The second person I met wanted to know if my children lived near me and how often I see them. He wanted to know what kind of a relationship I had with them – and how big were their husband’s. The third person I met was super. Nice looking, drove a Mercedes convertible – my favorite car – was a widower because his wife and daughter were run down by a DUI driver at the supermarket as they were leaving with their basket. That story sounded so familiar that I went to Chapter 4 of my book and found the exact same story there. Apparently Amazon missed the boat on that one. By this time I was beginning to get a little desperate. Only two more men to go, and I was not finding the soul mate I was looking for. I hoped that I would have better luck with Number 4. The minute I saw him I knew that something was off. He listed on his profile that he was 67, but he must have had a very hard life, because he looked 80. I mentioned something about that and he said, “I am 82, but I knew that if I put that age down no one would be interested in me.” He was right. I wasn’t interested in him. He has a wonderful personality, and is interested in so many of the things I am interested in. He is also a writer, a photographer, and, like me, gets seasick on the Star of India. All I am waiting for now is for him to give me the go-ahead to finish my book. Seven and a half years of loneliness is going to be coming to an end. Isn’t it too bad, though, that this is only an April Fool’s story? You sure had me! Fun way to share your loneliness and draw the reader right into your drama/needs. I was really hoping the last guy might be a keeper. Trick! m loved it. Funny. Keep writing! And think positive! Where do you live? As they say “on-line” – I’ll go anywhere to meet my soul mate! next time try Arkansas, they are great people and wont judge you by how awful you aged. good luck with finding Mr. Right, but i would imagine by now that you’ve already given up. Regrettably will not be looking for book.